Apple on Monday local China time announced a major expansion of its environmental responsibility operations in the region, including the creation of one million acres of responsibly managed forests and a buildout of clean energy infrastructure for manufacturing facilities, offices and retail stores. 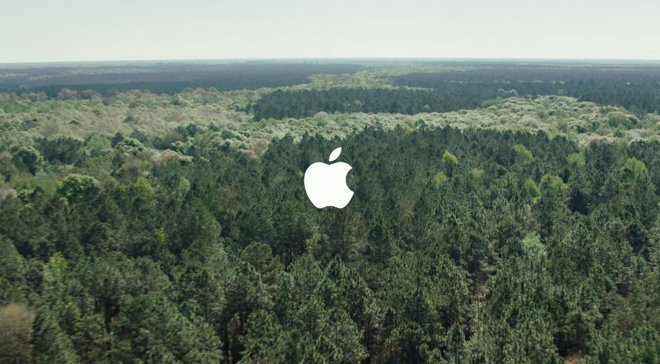 The managed forest initiative, established in cooperation with World Wildlife Fund China, is a multi-year plan that brings Apple closer to its goal of achieving net-zero impact on the world's virgin fiber. As the world's largest timber importer, China will also see benefits from growing and harvesting its own wood in a sustainable manner. "Forests, like energy, can be renewable resources," said Lisa Jackson, head of Apple's environmental efforts. "We believe we can run on naturally renewable resources and ensure that we protect--and create--as much sustainable working forest as needed to produce the virgin paper in our product packaging. This is an important step toward that goal and our commitment to leave the world better than we found it." Along with the forestry program, Apple offered further details on its upcoming 40-megawatt solar farm in Sichuan Province, which promises to generate enough energy to power the equivalent of 61,000 Chinese homes. The company is building two 20-megawatt solar installations in partnership with Leshan Electric Power Co., Sichuan Development Holding Co., Tianjin Tsinlien Investment Holding Co., Tianjin Zhonghuan Semiconductor Co. and SunPower Corporation. Apple also announced plans to expand renewable energy projects to Chinese factories manufacturing its products. "We've set an example by greening our data centers, retail stores and corporate offices, and we're ready to start leading the way toward reducing carbon emissions from manufacturing," said Apple CEO Tim Cook. "This won't happen overnight--in fact it will take years--but it's important work that has to happen, and Apple is in a unique position to take the initiative toward this ambitious goal. It is a responsibility we accept. We are excited to work with leaders in our supply chain who want to be on the cutting edge of China's green transformation." Today's news comes three weeks after Apple issued an update on a broader environmental responsibility program targeting all facets of product research, development, manufacture and sale. At the time, the company announced a recent purchase of 36,000 acres of forest in Maine and North Carolina, with output directed toward eco-friendly packaging. Also highlighted were clean energy installations like a hydroelectric plant in Oregon.